Quetzalcoatl is a Mesoamerican deity, whose name in the local Nahuatl language means ‘feathered serpent’. To the Aztecs he was a creator god and also had a parallel in Mayan culture to whom he was known as Kukulcan or Gucumatz. It is a commonly held belief among Mormons that Quetzalcoatl was Jesus Christ! 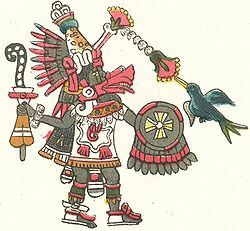 Harold T. Wilkins claimed[363.97] that Quetzalcoatl was from Atlantean Brazil. Lewis Spence also claimed an Atlantis connection for Quetzalcoatl.